‘Da State of Pidgin’ hana hou: Still Waiting for ‘da Big Pidgin Revolution’? Brian Rozema is a native of Grand Rapids, Michigan where he completed his undergraduate studies at Aquinas College. 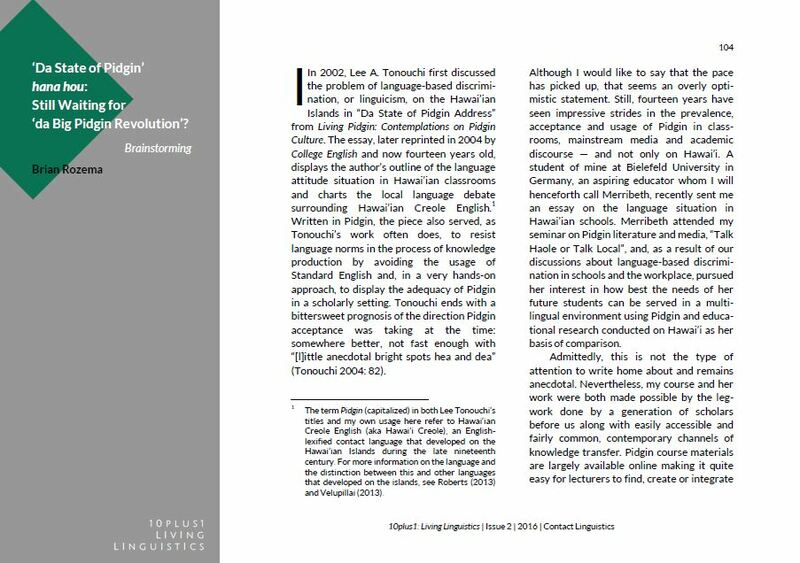 He is currently lecturing and working on his PhD at the Department of Linguistics and Literature at Bielefeld University in Germany. He serves as the English language editor for fiar – forum for inter-american research (www.interamerica.de), the official e-journal of the International Association of Inter-American Studies. He has also recently co-edited a collection of essays with Wilfried Raussert, Yolanda Campos and Marius Littschwager entitled Key Tropes in Inter-American Studies (Bilingual Press 2015). His research interests include Inter-American Studies, contact languages, creolistics, language attitudes, and the representation of marginalized languages—particularly Hawai’ian Creole English—in literature and other media in the Americas and beyond.